Boston's Logal Airport is the major one, but airports at Manchester NH, Providence RI and Windsor Locks CT are also important. 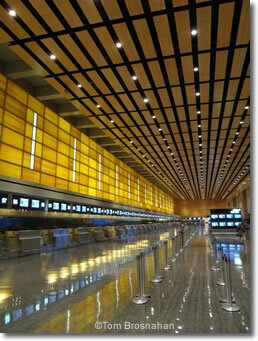 Likewise, Manchester-Boston Regional Airport near Manchester NH can be used to reach Boston and eastern Massachusetts. For central and western Massachusetts, the nearest large airport is Bradley International Airport in Windsor Locks CT, north of Hartford CT and south of Springfield MA. Numerous smaller airfields scattered throughout Massachusetts serve general aviation and limited commuter flights. at Logan Airport, Boston MA.